In each issue of Paleo Magazine, I team up with Steph Gaudreau to share the history of a traditional recipe and adapt it to fit into a healthier paleo lifestyle. (I write the words; she makes the gorgeous photos.) In a recent column, we went on a culinary trip to Southeast Asia to explore all there is to love about larb. 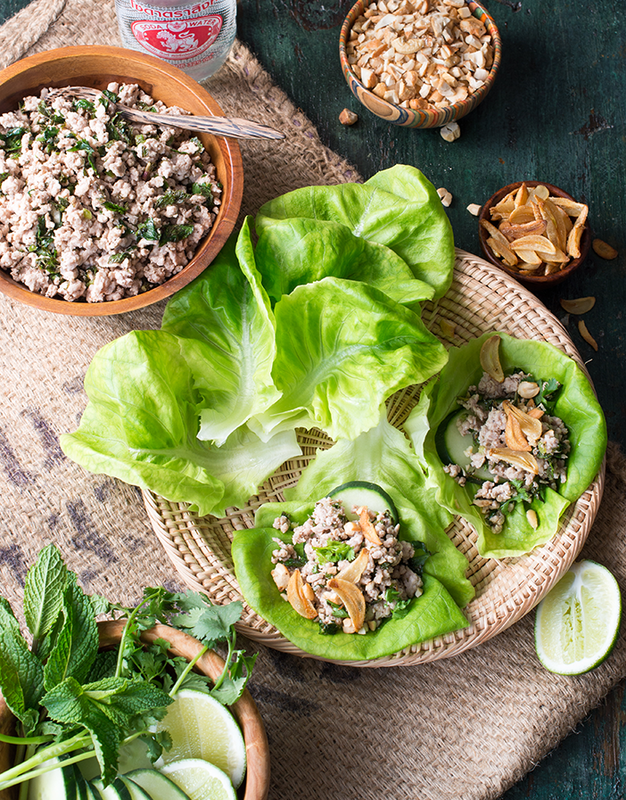 Larb is one of the most popular dishes in Thai cuisine. But just about the only thing everyone can agree on is that it tastes really, really good. Everything else about this Southeast Asian favorite is up for debate. The dish also blurs the line between salad, main course, and appetizer. And it raises the questions: Is it best served with rice alongside, with dried rice mixed in, or without rice entirely? Eaten cold, hot, or at room temperature? The pressing question of serving temperature set aside, there’s an additional conflict around whether it should be eaten cooked or raw. According to tradition and the general opinion in Thai food stalls, women and children always eat their larb cooked, but men—“real men”—enjoy their larb raw, and preferably, with entrails and blood thrown into the mixture for added virility. The one thing that most everyone seems to agree on, however, is that larb is a treasured, popular dish—in Laos, Thailand, China, and Myanmar, as well as the United States. Larb is usually prepared with minced or ground meat. Pork is the most popular, but chicken, duck, beef, and even fish are sometimes used, depending on the locale of the cook. The meat is stir-fried with chile peppers, fish sauce, and lime juice to form tender crumbles. Then the meat is removed from the heat and a handful of freshly-torn herbs—a blend of mint, cilantro, and/or basil—are mixed into the warm meat, the leaves wilting and infusing it with their cool, acerbic notes. At the table, small bowls of garnishes are passed around so diners can customize their own plates: a little more lime, extra herbs, crushed peanuts, and, sometimes, irresistible chips of fried garlic or shallots. The ingredients are simple, but when they come together, they create layers of flavor and contrasts that explode on the tongue: hot, cool, salty, crunchy, sour, sweet, chewy. Larb is commonly served at room temperature—although on a steamy day, a cold plate of larb can be quite appealing. It’s almost always accompanied by an array of raw vegetables: shredded cabbage, string beans, papaya, or fresh lettuce leaves to wrap around the scoops of meat. According to Thai artist Navin Rawanchaikul, the ability to eat larb is a sign of wealth in northern Thailand because meat is a comparatively expensive food there. When someone enjoys good luck—a winning lottery ticket or a pay raise at work, perhaps—they throw a larb party for friends and family to celebrate and share their good fortune. And at weddings, funerals, house warmings, and other significant occasions, gracious hosts always prepare larb to welcome their guests. We encourage you to use our adapted recipe to celebrate your good fortune with your favorite people. It’s the best party food because you can do the preparation and cooking in advance, then serve the larb at room temperature. Provide plenty of garnish options in colorful bowls and encourage your guests to play with their food. Prep the seasonings. Coarsely chop the cilantro and mint. Place the herbs in a medium mixing bowl and squeeze in the juice from the limes. Add the fish sauce, coconut sugar, and pepper. Finely mince the jalapeño and add it to the bowl, then mix all the ingredients with a fork and set aside. Cook the pork. Heat a large, nonstick skillet over medium-high heat, 2 minutes. Crumble the pork into the skillet and cook, breaking up the meat with a wooden spoon, until it is just pink, about 3 minutes. While it cooks, peel and crush the garlic cloves, then add them to the pan; continue to cook until the meat is browned and sizzling. Remove the pan from the heat and add the herb mixture. Stir until combined, and set aside to cool a bit. Make the garlic chips. Very thinly slice the garlic cloves and toss them with the baking soda until lightly coated. Place the coconut oil in a medium, non-stick saucepan over medium-high heat, about 3 minutes. Reduce the heat to medium, add the garlic, and stir-fry until golden brown and beginning to get crisp, about 5 minutes. Remove to paper towels to drain; the chips get crispier as they cool. Prep the veggies and garnish. Separate and wash the lettuce leaves, and thinly slice the cucumber. Crush the cashews and wash additional herbs for garnish. 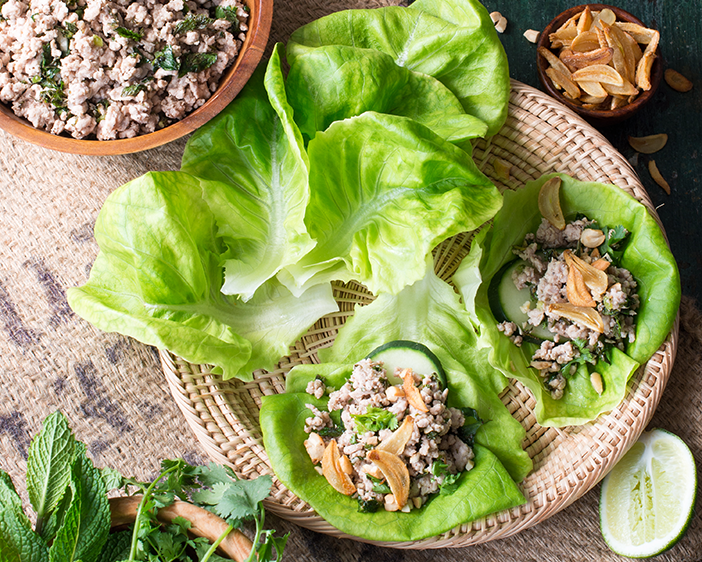 To serve, place lettuce leaves and cucumber slices on individual plates and spoon larb over the top. Garnish with additional cilantro and mint leaves, crushed cashews, garlic chips, and a squeeze of lime juice. For more delicious recipes like this one, subscribe to Paleo Magazine. Amazing…skipped the roasted garlic because I have kids and don’t have the time. Quick. Easy. Delicious. Please keep them coming ladies.